"This delicious dessert was a summer staple in my family growing up. 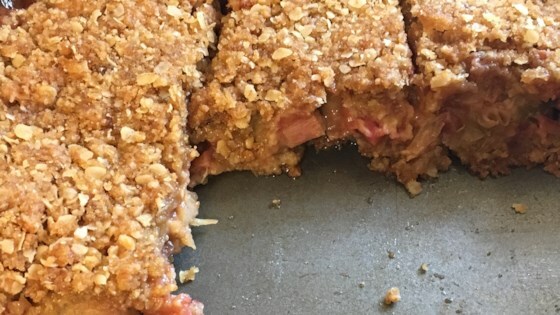 An easy, delicious way to use up the summer surplus of rhubarb!" Mix rhubarb, 1 tablespoon flour, sugar, water, cinnamon, and allspice together in a bowl. Mix oats, brown sugar, and 1/2 cup flour together in a separate bowl; add butter and mash into the oats mixture with a pastry cutter until crumbly. Press about half the oats mixture into the bottom of the prepared baking dish. Spread rhubarb mixture over the oats mixture; top with remaining oats mixture. Bake in preheated oven until rhubarb layer is set, about 45 minutes. Great recipe! I increased the rhubarb to 4 c. because I had a lot, but otherwise made no changes. Made it again, in a 9x13 doubling everything and adding two more cups of rhubarb (8 total) and leaving out the allspice this time. turned out great! This was delicious. I doubled the recipe to make it in a 9x13 and used 7 cups of rhubarb. Make sure you grease the pan well!